With the Guild defeated, the Agency and the Mafia maintain a tentative peace, in part because both sides are waiting to see what will become of those Guild members who were left behind. At least one of them, Nathaniel Hawthorne, looks like he may have joined up with the mysterious Fyodor Dostoyevsky, dangerous man with a reputation as a “vampire.” With Kunikida the target of the latest attacks on the Agency and Atsushi forced to deal with his past traumas, the going is anything but smooth for the Ability Users of this alternate reality. 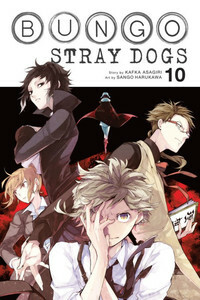 Volume ten of Kafka Asagiri and Sango Harukawa 's Bungō Stray Dogs picks up right where season two of the anime left off, with the aftermath of the battle against the Guild. The Port Mafia is still out and about doing their thing, but the much smaller Ability user group known as the Agency is in full recovery mode – meaning that the book opens with them sprawled in the café on the ground floor of their building. Technically speaking, this is so close to precisely where the anime ended that those who don't want to wait for season three (set to begin in the spring season of 2019) could just pick this up and not really feel lost. More interesting than the proof that anime and manga are closely related is the direction this new story arc appears to be headed in: way back. This volume directly deals with both Kunikida's and Atsushi's pasts, looking at them not so much as things that turned them into the people they are today, but more as something that needs to be overcome if either is to move forward. This volume is much more direct with that in terms of Atsushi when the first case he faces after the Guild war is the death of the man who ran the orphanage. Atsushi's sad orphan flashbacks happen so frequently in the first nine books of the series that they almost felt like a bit of a joke, or at least an authorial sledgehammer reminding us of how tortured and sad he was before he joined the Agency and gained Dazai as a mentor. What those flashbacks didn't remind us of, however, turns out to be much more important: the head priest at the orphanage was the closest thing to a father figure that Atsushi ever knew. From our comfortable distance as the readers of the story, we can question that all we like, pointing out how unhealthy and abusive their relationship was and that love is perhaps the last thing Atsushi should feel for the man who made him ashamed of who and what he is. Closer ties, however, make for some difficult feelings, and when Atsushi's need to be loved and acceptance is paired with more of a reveal about the man who raised him, things become complicated. Again, it isn't healthy in any way – neither the reasons behind the man's actions nor Atsushi's feelings about/for him. But it is because of how he was raised that Atsushi is able to be the person he currently is; he can want to save Kyouka to prevent someone else from going through what he did and he can imprint on Dazai because he provides more of what Atsushi was actually looking for in a parental figure. But until he sorts through everything in his heart and mind, he can't move on from his complicated feelings about the orphanage director, and that's the work of his part in this volume, or at least the start of it. Kunikida, on the other hand, is forced to cope with his regimented way of working (and living) and living up to his ideals, which is not always an easy combination. His story takes up the two middle chapters of the book, and where Atsushi's opening chapters read like a terrible (in a good way) Victorian orphanage novel, Kunikida's is much more of the action/mystery hybrid that has been the norm for the series. Among other things, this storyline allows us to see Kunikida as more prepared than even we'd expect for any eventuality. It isn't really a secret that he's the most dependable of the detectives working at the Agency, but these chapters delve into that much more than his appearances with other characters have truly allowed for, showing not only his own Ability and detective skill, but also the lengths to which he will go and the bonds he has with the other members of the group. This promises to be important as the next villain appears on the scene, a very alarming version of Russian novelist Fyodor Dostoyevsky. This version of the author appears to draw influence from his time in a Siberian prison from 1849-54, during which time he was classified as a particularly dangerous man. He's the leader of an ominously named group of Ability users, The Rats in the House of the Dead, and it is under his wing that we saw Nathaniel Hawthorne settling at the end of the previous story arc. Although we don't know much about the man yet, apart from the fact that he's extremely dangerous and deemed such by the Port Mafia, who attempt his capture, he appears all on his own to be above the level of all of the Guild members who assaulted Yokohama. That Kunikida's and Atsushi's character work in this book is in service of dealing with the threat he and his skill Crime and Punishment pose seems like a safe bet. As always, part of the joy of this series is seeing new characters based on great authors appear, and Dostoyevsky isn't the only introduced this time – naturalist author Katai Tayama also shows up as a homebound Agency detective (based on his work Futon, sometimes translated as “The Quilt”), and we get more of a chance to see previous background characters like Higuchi and Gin play a slightly larger role. This helps the volume feel like a blend of wrapping up and starting a new plotline, which works in its favor. Harukawa's art can be a little difficult to follow at times (and aspects of the characters' outfits don't help with the confusion), but overall Bungō Stray Dogs maintains the pacing, plotting, and characters that have continued to make it a fun read even if you aren't a literature enthusiast.